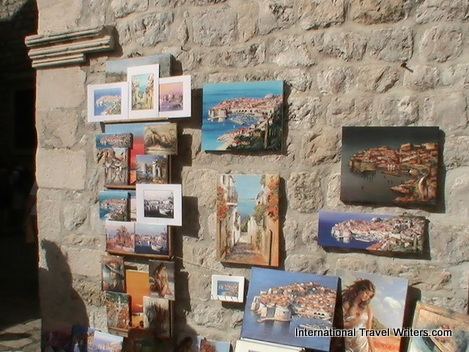 Dubrovnik is a walled city on the Adriatic Sea coast of Croatia. In 1979 the city joined the UNESCO list of World Heritage Sites. It was the only eastern Adriatic city-state to rival Venice. 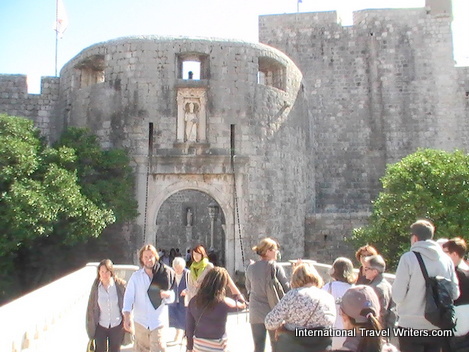 It is among the 10 best medieval walled cities in the world. The fall of Constantinople in 1453 to the Ottomans led to a lot of the fortifications being built. Bosnia fell in 14163 and that also was a motivation to build with speed. The walls run over a mile around the city. The walls run from four to six meters thick on the landward side but are thinner on the seaward side. There are a number of turrets and towers that assisted in protecting the city. 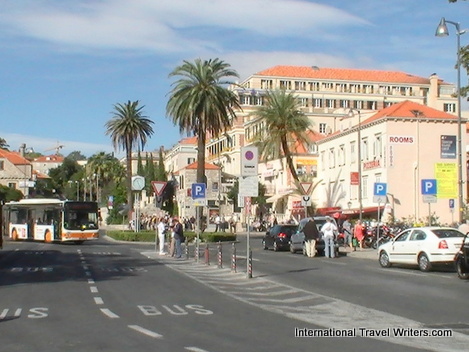 Walking Tour & Cable Car…Depart the port by foot to the cable car station and proceed to Srd Hill, where you’ll enjoy a panoramic view of Dubrovnik. Return by cable car and start a walking tour of the Old Town. Free time in the Old Town and return to the ship at your leisure. 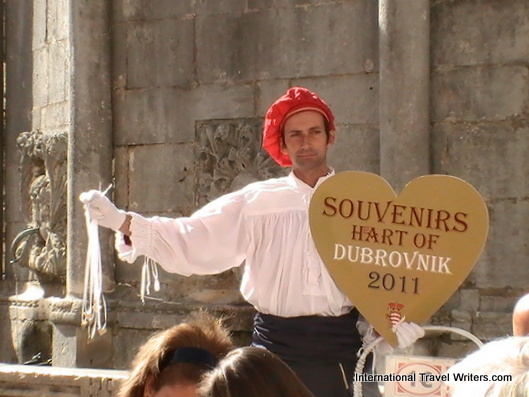 Dubrovnik & Village Life…Walking tour of the Old Town with some free time. Drive to Konavle Valley to a family country home where, for generations, this family has produced grape brandy, olive oil and wine the traditional way. Stroll through the wine cellars, past the olive press and enjoy a light tasting of local specialties. Charming Croatina Riviera…Drive through the Konalve Valley to a restaurant located in an old mill next to the cascading waters of the Ljuta River and enjoy a local snack. Continue to the seaside resort of Cavtat for some free time. After a brief orientation, explore Old Town on your own. 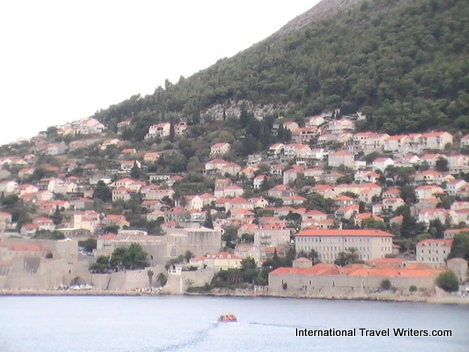 Scenic Dubrovnik by Land & Sea…An approx.. 60 minute scenic boat ride along the picturesque Lorrum Island and Plce, an area known for its luxury hotels, and pass the impressive site of the City Ramparts. 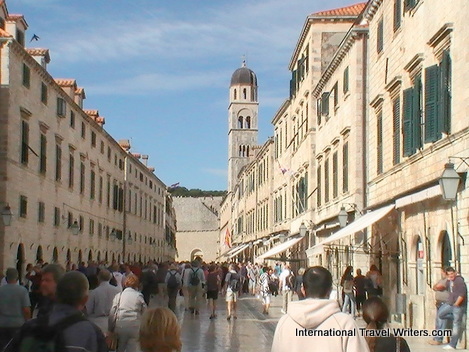 Walk the charming streets of the Old Town Port with an experienced guide, showing the most interesting places. After the tour, you’ll have ample time to explore the Old Town on your own. Biking Adventure…Depart by motor coach along the Adriatic Road through the countryside toward the Village of Gruda. You’ll be met by a professional staff who give a tour briefing. Start your scenic ride, as you’ll be passing through the countryside, vineyards, and along the Ljuta River. 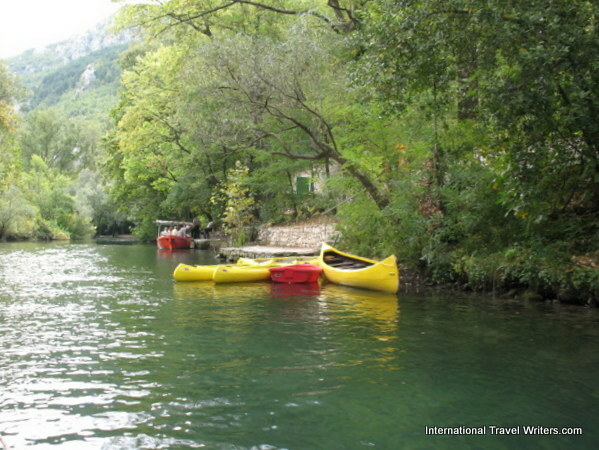 Stop near the Ljuta River, where you’ll be served fresh local fruits. Visit a local winery in Gruda Village for a wine tasting. Ultimate Dubrovnik…Depart the port by foot to the cable car station and proceed to Srd Hill, where you’ll enjoy a panoramic view. Enjoy spectacular views while sipping a glass of Croatian wine and tasting some of the finest Croatian cheeses. Depart to the seaside resort town of Cavtat, an ancient city dating back to the 6th century BC. Free time to sit at one of the many cafes along the coast or enjoy a nice walk along the sea front promenade. Short guided tour of Old Town followed by free time. 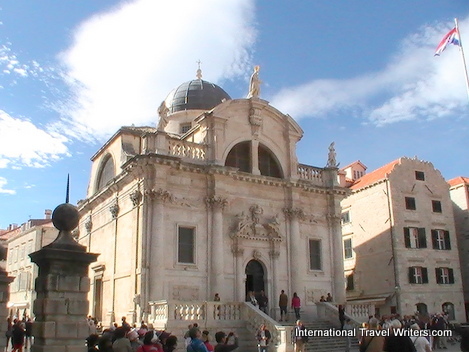 Historic Dubrovnik & Panorama…Discover the history as you walk along the streets of Old Town and visit the Dominican Monastery and Church. Enjoy outside views of Rector’s Palace, Sponza Palace, pass the Church of St. Blaise, Onoffriu’s Fountain and other historical landmarks. Board the bus and head up to a viewpoint over the city. Ultimate Taste of Dalmatia…See the country side, meet the locals and sample local products and cuisine without missing the highlights of the city. Scenic bus ride along the Adriatic coastline. Stop in the charming village of Orasac and visit an old home for taste of some homemade cheese, smoked ham and wine. Enjoy a demonstration of how olive oil was produced the old fashioned way. Visit the small town of Ston, the oyster capital of Croatia. 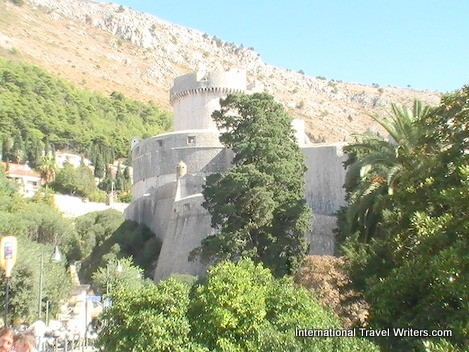 This town is often called a smaller version of Dubrovnik due to the 6 km long walls surrounding it, one of the world’s longest defensive walls. In Mali Ston, board a local boat where you will be introduced to oyster & mussel beds, their production, and have the opportunity to taste fresh mussels and oysters. Step back ashore for sea food specialties served in a local tavern. Guided walking tour of Old Town flowed by free time for further independent exploration. 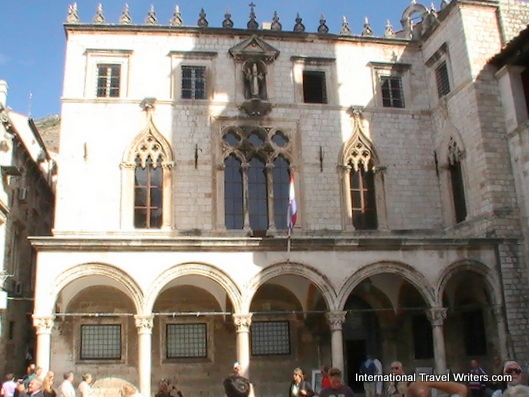 Sponza Palace was built 1516-1522 and sits at the end of Stradun street. It used to house the custom office, the mint, the bank and the armoury. It’s a mixture of Gothic and Renaissance styles. 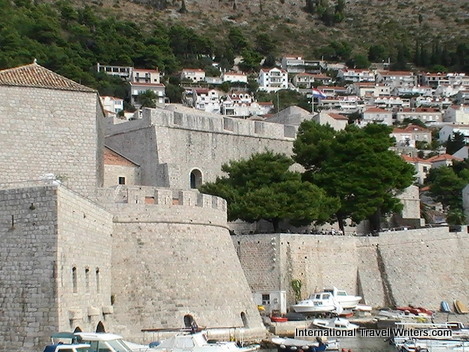 It is now the archive and has a special opening ceremony of the Dubrovnik Summer Festival. St Blaise Church is a baroque church built in between 1705 and 1717. It is modeled on San Maurizio in Venice. The church displays an impressive array of relics. It was built in honor of the city's patron saint. 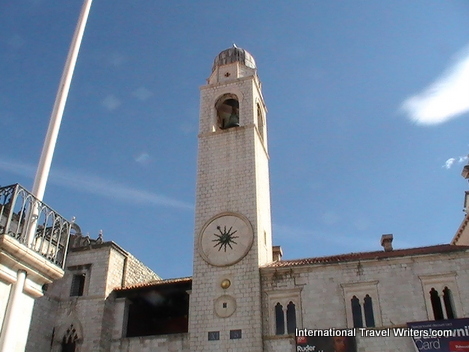 City Bell Tower is 35m tall and dates from 1444 but it was rebuilt in 1928. The modern clock has bronze jacks in the form of soldiers that strike the hour. The bell in the tower weighs over 2000 kilos. 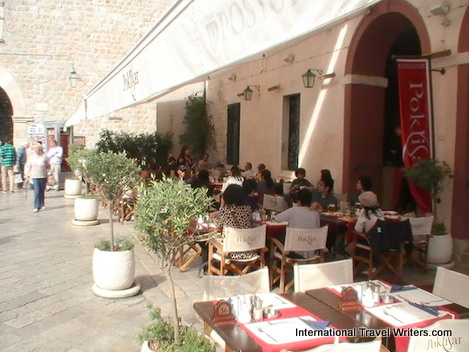 Outdoor restaurants are plentiful and their menus are displayed outside. As you saunter through the streets you see art work by local artists on display. 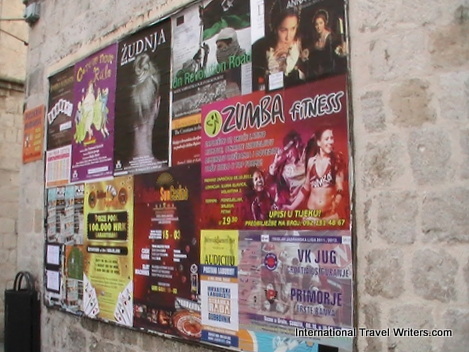 Billboards are in evidence showing current activities at the theaters and other venues. 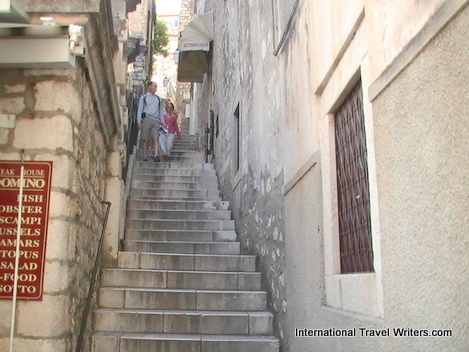 Of course being a medieval location there are narrow streets but the stairs were also very narrow. This is the Croatian equivalent of sandwich-board advertising. 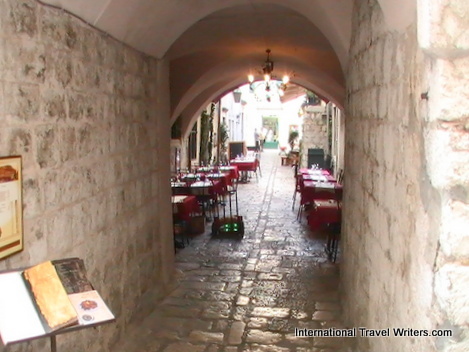 Sometimes there were passageways through the walls into restaurants or other shopping areas. Stradun is the main street and it was fairly active most of the day. This is Pila Gate. There are four city gates. Two lead to the harbor and two have drawbridges that lead to the mainland. Today the moat that ran around the outside section of the city walls is a dry moat with gardens. Over the arch of the central Pila Gatee is a statue of the city patron St. Blaise. St. Lawrence Fortress is located outside the western city walls around 120 feet above sea level. The walls that faced enemy fire were around 39 feet thick. Two drawbridges lead to the fort. 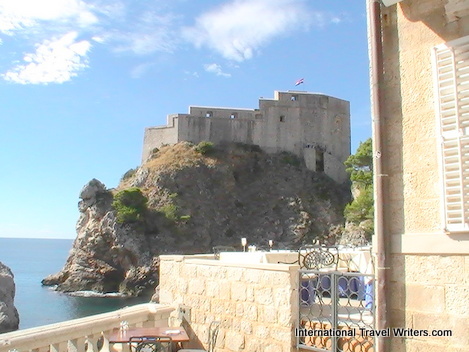 It is often called Dubrovnik’s Gibraltar. Minceta Tower was built by Italian engineers sent by Pope Pius II in 1463 at the height of the Turkish threat. It is named for the family that owned the land it is built on. 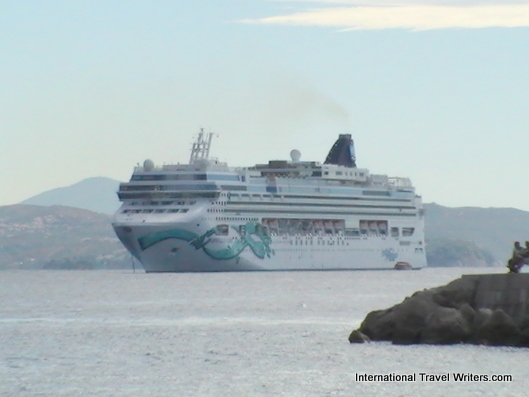 When it was time to head back to the Norwegian Jade by tender, we got a photo of it waiting for us to arrive.